To many, Louis Prang is known as the “father of the American Christmas card.” This may not have been the case if not for a chance encounter in Vienna, Austria. After introducing the American public to Christmas greeting cards in 1875, Prang's career quickly escalated, making him a household name. Commissioning the country's best illustrators and creating design competitions, Prang sold beautiful cards that were unmatched for years. He also created fun and interesting cards for almost every holiday of the year. In 1873, Prang travelled to Austria for the Vienna Exposition. While there, he handed out chromolithographed business cards decorated with flowers and other simple designs. When he handed one to the wife of his British agent, she suggested that he take these small decorative cards and sell them with a Christmas greeting. To test whether this would work, Prang sold these small greeting cards in England the next year. After success overseas, Prang began selling Christmas cards in Boston for the 1875 holiday season. At its height, Prang was producing up to five million cards per year. 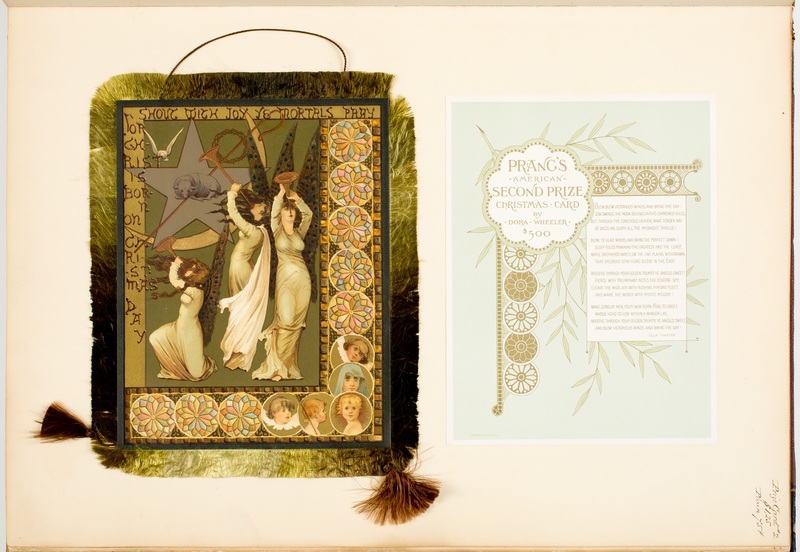 Beginning in 1880 and lasting for four years, Prang held annual design competitions for new Christmas cards. These competitions awarded artists up to $1000 for their designs. Once an artist entered a design, it became the property of L. Prang & Co. to use as it wished. 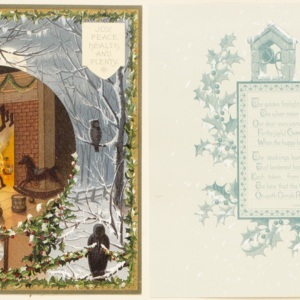 It was around this time that the size of the Christmas cards Prang produced grew from small pocket-sized cards, to cards up to 6x8 inches, with the option of decorative details like silk fringing. Needing an original painting to work from when creating a chromolithograph, Prang solicited artists and art students to produce designs that he could use to create and sell Christmas cards. The first competition was held in the spring of 1880, and prizes ranged from $200 to $1000. Submitted designs were judged in New York at the American Art Gallery and in Boston at the Doll & Richards Gallery. Each entry was required to be 6 x 8 inches, likely to make it easier to be transferred to a chromolithograph. Over 800 entries came in, many of them from female artists. The first prize winner for this initial contest was Rosina Emmet, an artist who had studied under William Merritt Chase in New York, and came from a family of artists. She had also designed textiles for Tiffany & Company in New York. The design featured five children singing in a choir with a decorative border, one child playing a violin. The second competition, held in February, 1881, was also judged at the American Art Gallery in New York, but this time the contest was only open to American artists. This time, almost 1,500 entries came in, and it was artist Elihu Vedder who won first prize for his design of of a woman dressed in gold, with decoration in gold, blue and green. 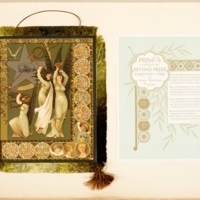 Second place went to Dora Wheeler, who had also studied under Chase with Rosina Emmet and worked with her at Tiffany & Co. Wheeler's design featured three trumpeting angels with wings made of peacock feathers. The text reads "Shout with joy ye mortals pray. For Christ is born on Christmas Day." In the lower right corner, a Child Jesus, St. John the Baptist, Virgin Mary and two cherubs are within small medallions. The card featured a poem on the back of the card by Celia Thaxter. It sold for $1.25 per card with silk fringe, and $.75 without. The third card competition was held in the fall of 1881 and was again limited to American artists. In addition to the artist-judged competition, Prang included a second public competition, where visitors who went to the galleries in New York and Boston could vote for their favorites. Dora Wheeler's "The light of the world" design won both prizes. The last competition was held in the fall of 1884. Prang invited twenty two artists to compete with each other for the prize, including Prang collaborators and female artists Lizbeth B. Humphrey, Dora Wheeler and Rosina Emmet. While it was C.E. Weldon who won the first prize, it was Humphrey's card that won the popular prize and garnered much attention. 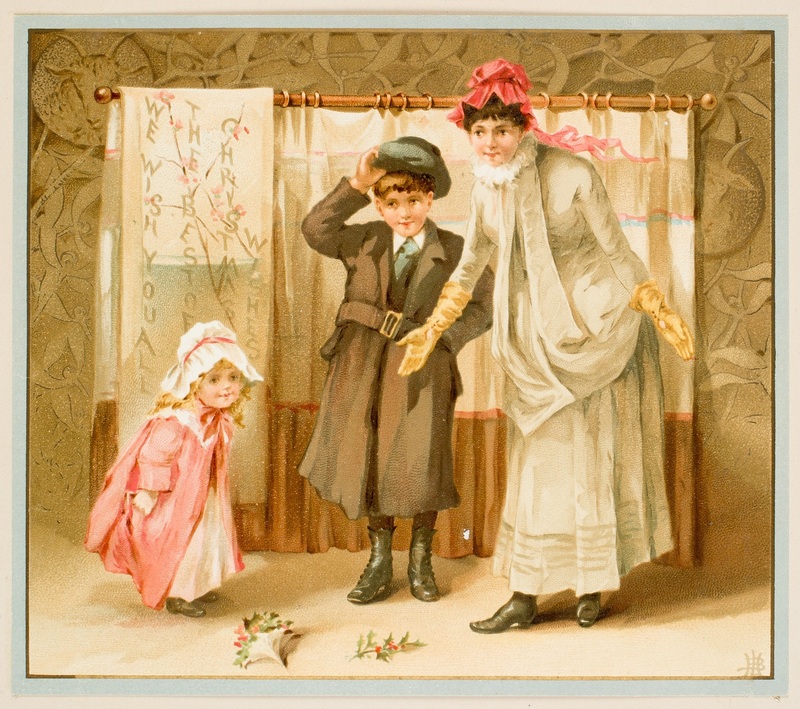 Known as the "Boston prize card" this card depicts a woman and two children standing before a curtain with a banner draped over it reading "We wish you all the best of Christmas wishes." 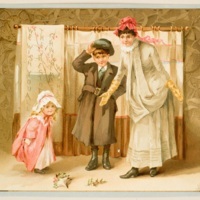 This simple scene won the people's vote and featured a common scene in American homes at the time; children putting on a performance for family and friends in a parlor.